4 36V 1kw scooter motors as used by quite a few heavyweights for drive. Bought for a robot I never got around to making they have never been used, just knocked about in a storage box for a couple of years. Currently at £65 retail selling here for £50. Postage is tricky on these due to the weight (5kg each), people are free to collect from near salisbury, collect from Antfreeze (2nd feb) or UWE beetle event (24th Feb). 3 1/2" x 1 1/4" colsons. 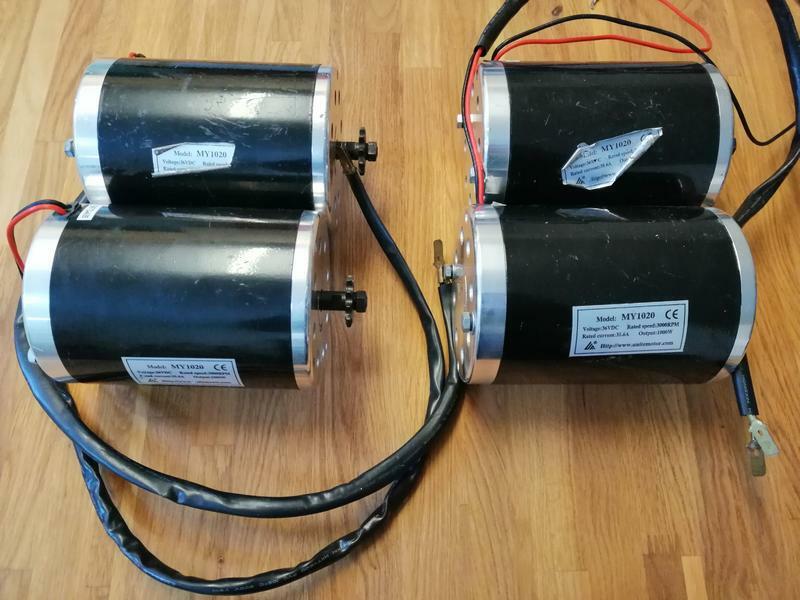 For sale are 2 mario S900 gearboxes mated to alienpower motors. These are a nice pairing of gearbox and brushless motor (300kv 1.2kw IIRC I think we used to run it on 5S) that while old are still good. The gearboxes alone are in great condition and could be swapped to another more modern motor. Weight of ~825g per gearbox + motor. Not sure on the exact motors, they were discontinuead a while backbut 50-60's would work well on this gearbox with a different adapter plate. - The plate between the gearbox and motor could do with the screws being more appropriately sized for full thread engagement (length of bolt). - One drive motor and spare has had its sensors removed, the other still has them but their status is unknown. Last edited by Shakey; 9th March 2019 at 10:12. 2 brushed motors and FW brushless sold. Colsons and 2 brushed motors remain! Colsons are sold, Scooties remain and I've dropped the price a tad + Listed postage.